Why Collectors Collect: R.T Gwynn. My niece Meredith is just about to graduate from Central St Martin’s after three intense years studying Art Criticism, Communication and Curation. As you can see she is following in family footsteps. And as I look back into the last 100 years of the Women’s Institute for my latest project, the family links keep appearing. 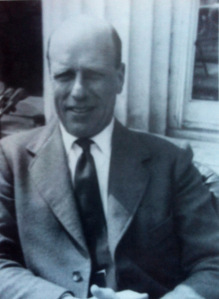 My grandfather, about whom Meredith writes in her blog, started on the shop floor at Woolworth’s Princes Street store in Edinburgh in the 1920’s, and went on to be Managing Director. He pursued his interest in arms, armour, clocks and furniture at the same time. I am now sitting at my desk finishing my manuscript for the WI in my 17th Century cottage, furnished with pieces from his collection of English early oak furniture. And reading Merry’s blog…. I love the serendipity of it all. To start my blog I would like to talk about my inspiration and career role model, R.T Gwynn, he was my great grandfather and a passionate collector of Early Renaissance and Gothic arms and armour, mid-17th Century clocks and early English oak furniture. I would like to use his stories as an example and excuse to look into the reasoning behind why a collector collects. R.T. Gwynn (known as Peter). He said that his passion for history and collections started from an early age and can even be pin-pointed to his time spent as a chorister at Gloucester Cathedral at the age of ten. He later wrote “the daily association with the Cathedral gave me an interest in the Medieval period and influenced my collecting objects from that period”. This entry was posted in Comment and tagged Arms and armour, collectors, R T Gwynn, Women's Institute. Bookmark the permalink.